Who would want to miss a smoke-free city with its almost zero-crime rate? Surf the net, book a plane ticket, fly for only 1.5 hours to the Northwestern part of Mindanao, and set foot in Dipolog City. Dipolog’s name came from the word dipag (to cross the river in the Subanen dialect) that was mistakenly heard by the Spanish conquerors as Dipolog, which is being used up to this time. 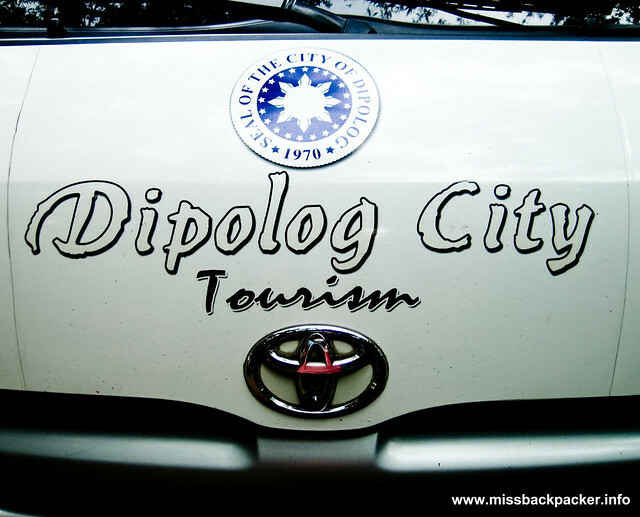 Let’s now see my checklist of what to do or visit during your laid-back Dipolog vacation. Welcome to the Bottled Sardines Capital of the Philippines! A proof of Jose Rizal’s (Philippine national hero) many talents, Holy Rosary Cathedral is one of the main tourist attractions in Dipolog, which should not be missed. Built circa 1895, it is said that Rizal designed the cathedral’s still-functional altar as requested by one of his former professors. As part of our Tourism Department’s campaign Lakbay Jose Rizal at 150, the cathedral is also a stop for those who collect stamps for their Rizal passports. 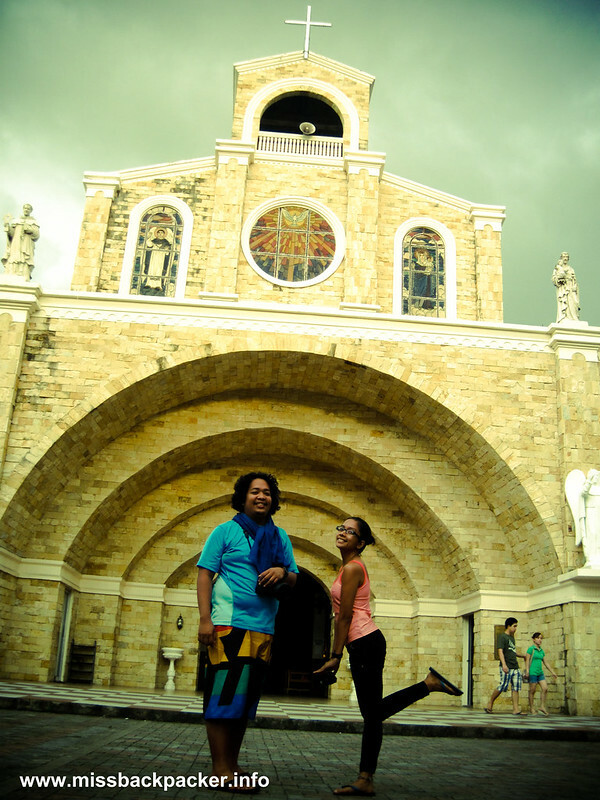 When you visit the cathedral, look for the statue of one of Dipolog’s patron saints located at the right wing entrance. I don’t know but, to me, it looks like it’s flipping its middle finger. Our outfit seemed a little inappropriate for the cathedral. Just facing the vastness of Sulu Sea, Dipolog Boulevard is projected to stretch 3.5 kilometers once continuous development is completed. Presently, 1.4 kilometers of the boulevard can be used for recreational activities whereas restrooms and several benches are also built for visitors. And when you’re tired staring at the blanket of Sulu Sea, you can stuff your bellies with streetfoods from Dipolog’s own version of MacDo, a stretch of streetfood vendors which is just at the back of the boulevard. It means makduko which literally translates to bending over so you can choose among the variety of food that each stall has to offer. Way better and cleaner than Manila’s Roxas Boulevard. One doesn’t have to be sporty to be 486 meters above sea level. 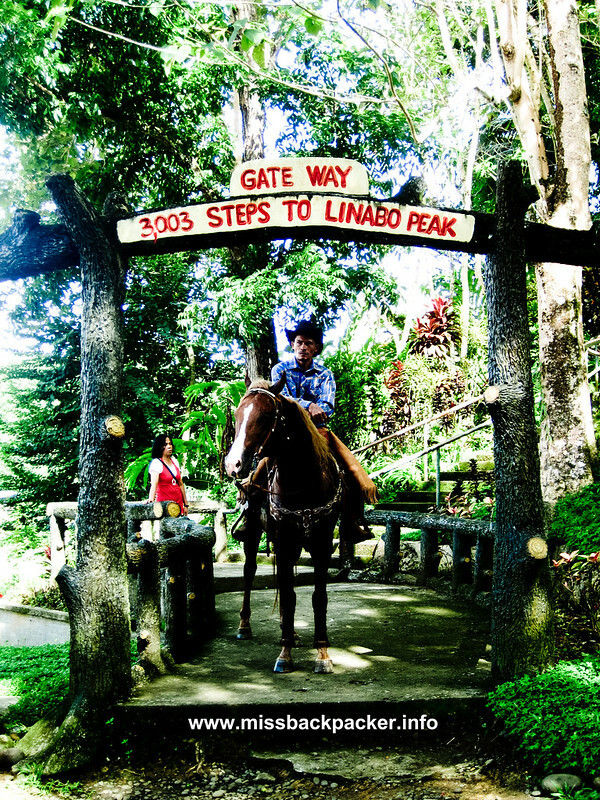 With just 3003 steps, the twin cities of Dipolog and Dapitan can now be viewed at the peak of Linabo, the highest point in Dipolog. Along the concrete steps are the 14 Stations of the Cross shaded by healthy trees where a community chapel can be found at the peak. To complete these steps is another reason why I need to go back to Dipolog. A Tyrolean Traverse is a method of crossing through free space between two high points on a rope. This is used in a range of mountaineering activities: rock climbing, technical and recreational tree climbing, caving and water crossings. A zip line is in essence a Tyrolean Traverse which is traveled down quickly with the assistance of gravity. If that doesn’t make any good sense, look at the photo below. This is one of the popular activities in Sungkilaw Falls aside from rapelling, camping, and swimming. The cascading waters of Sungkilaw (insert meaning here) is amazing and to die for. Prepare for a short 200-step hike when visiting the falls. You think this is easy? Try it. The whole park has a huge land area of 344 hectares where 40 hectares of its totality are home to rare fauna species as a result of a massive tree planting done in the late 1950s. Exotic birds, which are believed to have been inhabiting the city, can also be found in the park’s Aviary. Aside from these, a replica of a Subanen Village is built to showcase the tribe’s traditional dances, rituals, and talents in weaving baskets. The great thing about this part is you get to meet real Subanen people wearing their colorful native clothing. The name of the park is derived from Barangay Cogon to where the entrance is situated. 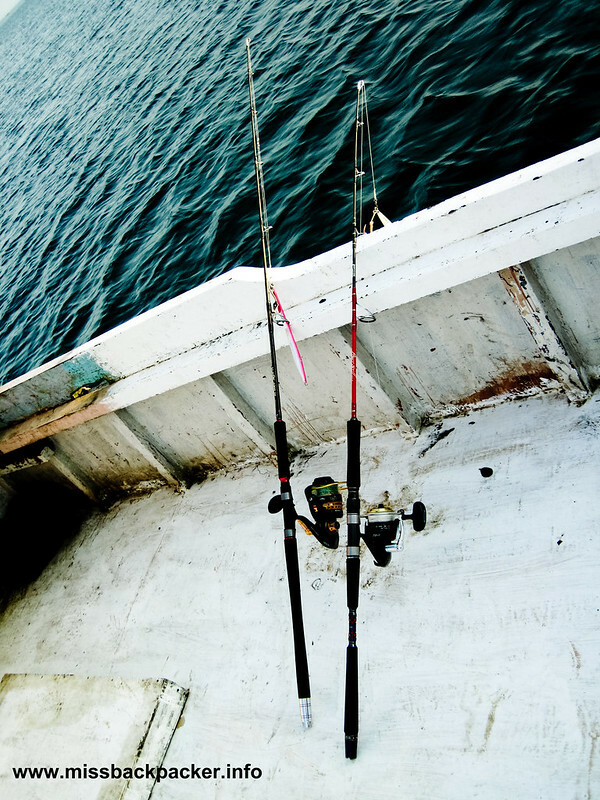 Known as the only sport-fishing destination in the whole of Mindanao, every visitors must try jigging, type of fishing using, of course, a jig as a lure. Dipolog has its own association of Anglers who will be more than happy to assist you should you want to experience luring and catching up to 10-kilo gigantic fishes. Ready for some digging err jigging? This is one cafe that will give you eccentric yet very relaxing vibes. Goodtimes Cafe is a 1000-square meter spot with a two-storey ancestral house filled with earthly statues, paintings, and other several form of artworks. It may look eerie to the eyes of the conservatives but the pieces of art filling each spaces of the cafe is nothing but exceptional. You can say that someone put so much effort to every artworks as depicted by the owner, Ed Tabancura, who never got to have a family of his own dedicating his life to continuous improvement of the cafe. 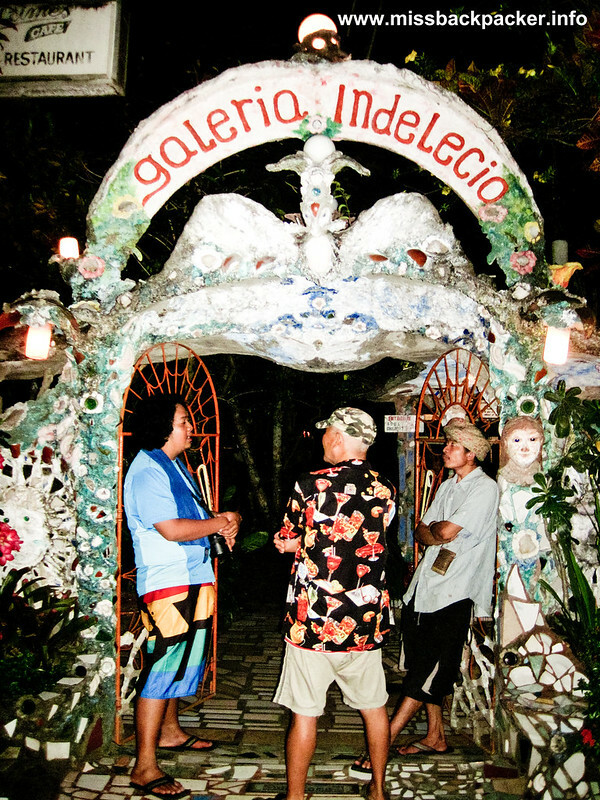 A lot of known artists fly to Dipolog just to witness the beauty of this cafe-slash-art gallery. Rowjie with artists Ed Tabancura and Subanen Aldrin Elman. Also known as Pagsalabuk Circle, this fountain was designed to remind everyone how uniqueness can be also be a form of unity. The statues are of the Muslims, Christians, and Subanen, first inhabitants of Dipolog who have diverse beliefs yet united to protect the place from invasion and destruction. The bowl being raised to the heavens is a portraiture of thanksgiving and offering to the creator. 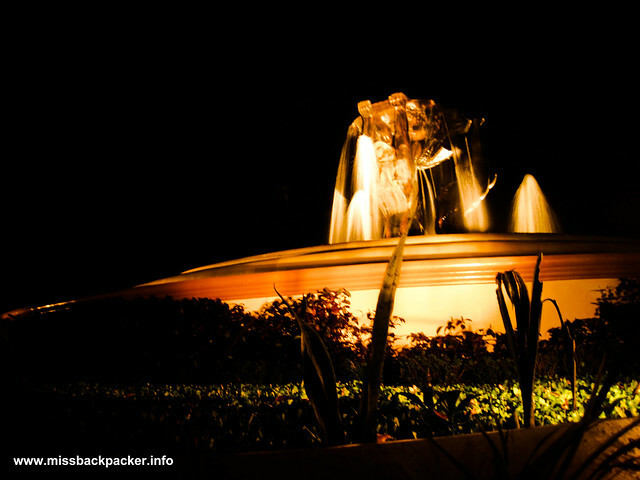 The Rotonda is well-lit at night, perfect for picture-taking. Apologies for the blurry picture as my PNS has limited features for night shots. You can have your dinner at Karyll’s Grill located near the boulevard to wrap up your day. 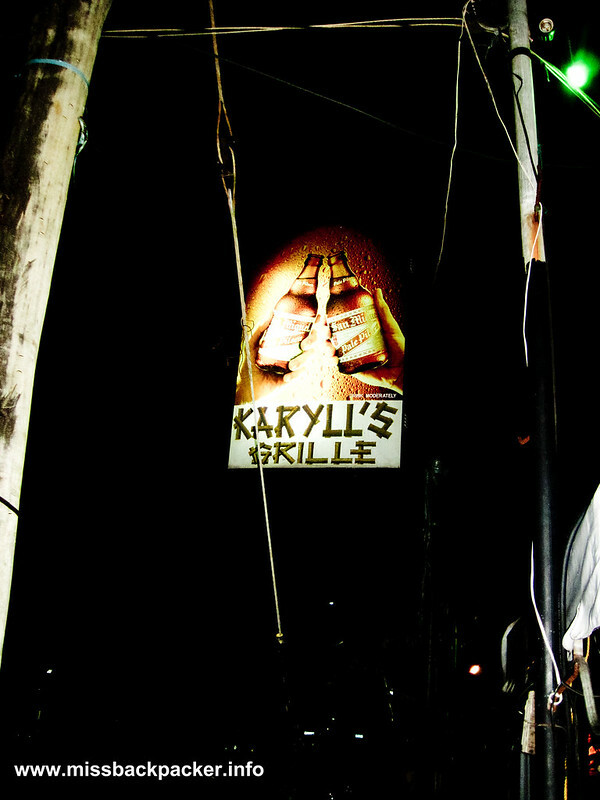 Dipolog may be a laid-back city but Karyll’s Grill was awarded as best reseller of San Miguel Corporation’s beer last 2010 in the nationwide category. At night, the city transforms into a different environment as night parties are also held in Dipolog even on a regular weekend. Their grilled seafood are their specialty. So there, a recap of the top activities that you should not miss during your first visit of Dipolog City! Questions? Let me know. 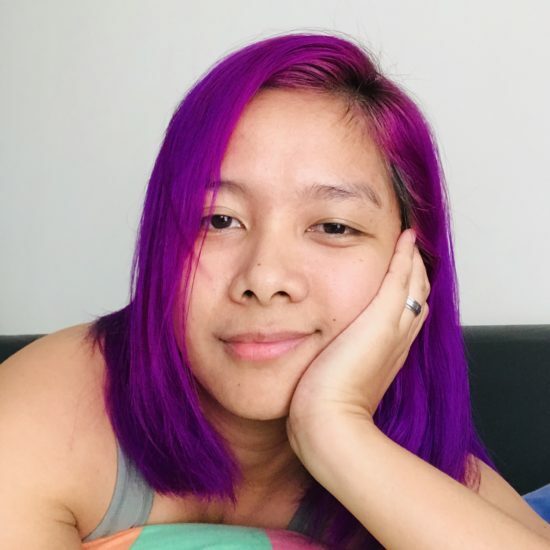 I am from Dipolog City, Zamboanga del Norte; and my blog is dedicated to all things Dipolog City and Zamboanga del Norte, and everything South. Hope you had a fun visit in Dipolog, and feel free to visit any time soon. 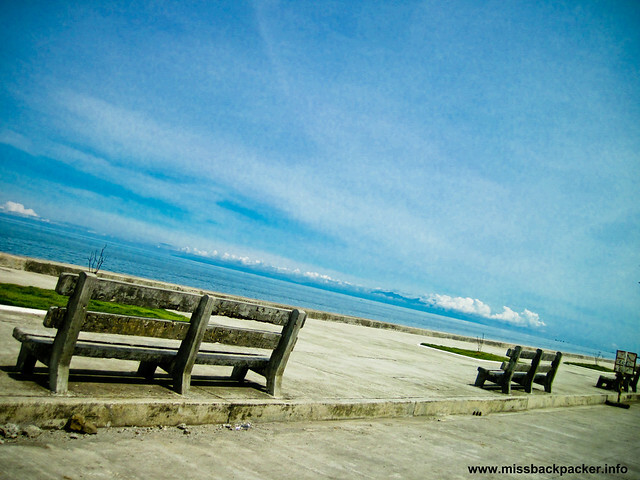 The pleasures of Dipolog go beyond the city limits. 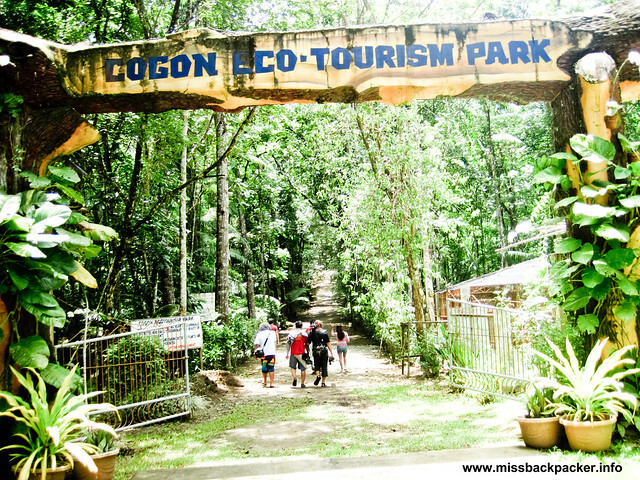 The Eco-Tourism Complex in Barangay Cogon is a leading environmental destination with a lush 344-hectare forest marvellous for trekking. The Subanen House within the complex is also where the traditional Subano dance is performed for the visitors. thanks nortehanon for the encouragemetn. hopefully i can write more items here. enjoy dipolog city. for the rapelling in sungkilaw falls, do we have to make an early arrangements for that one? and oh by the way, how far it is from dipolog downtown area? Hi Dip! I might not be able to be of great help kasi our trip was organized by GMA 7. Pero most probably, you need to contact the people in charge prior your visit. The travel time however is like 20 to 30 minutes (from town proper). at least you responded to my comment. malapit lang pala….